Our guide to Paso Robles will help you find the best bed and breakfasts in Paso Robles California. There are tons of great bed and breakfasts in the city of Paso Robles, our city guide will help you find the best bed and breakfasts. You may have a hard time deciding what to do in Paso Robles, but we make your decision easy. 1455 Kiler Cyn Rd, (805) 238-3362 - Nestled among the rolling green hills and vineyards of Paso Robles wine country, the Canyon Villa is the destination destined to win your heart. 1985 Peachy Cyn Rd, (805) 237-8895 - Our Tuscan Retreat Bed & Breakfast is located in the Paso Robles wine region of Central California. 3650 Mustang Springs Rd, (805) 227-4685 - La Bella Rose is the beautiful, new two bedroom guest house of Bella Collina, a Palladian style villa atop the Westside hills of Paso Robles. There are plenty more bed and breakfasts in Paso Robles. 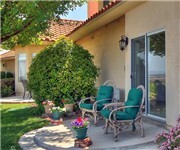 See all bed and breakfasts in Paso Robles California.